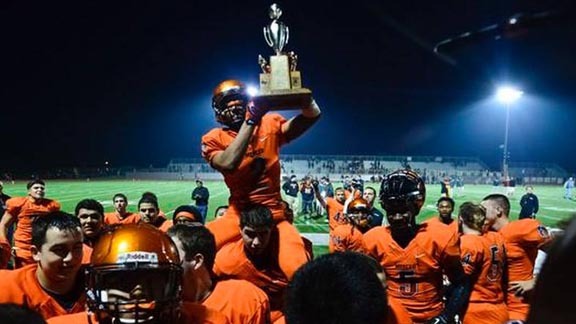 Merced running back Jabar Byrd hoists Bernasconi Memorial Mayor’s Cup after win vs. city rival Golden Valley during 2014 season. Photo: Andrew Kuhn/MercedSunStar.com. Our second school of the summer that goes into the spotlight for having its football history chronicled through all-time reported scores is Merced. It’s a school that is more than 100 years old with more than 500 reported wins, but it was a stretch of years in the late 1980s and early 1990s that stand out the most. And in one of those years the Bears were State Team of the Year. Up next in this series: Antioch. Yes, you could say that expectations are sky high in the East Contra Costa County community after an 11-1 season and with the return of the most celebrated running back in the state and nation. But the Panthers will now have their history revealed to put the upcoming 2016 season in perspective. For more on the Cal-Hi Sports football archives project and how we can help your school, CLICK HERE. Note: One doesn’t have to be the football coach or AD to order this work. It can be presented to any school as a gift. There have been reported scores (at least one) from Merced High football teams dating back to 1898. And while the school doesn’t have many other known results between then and 1922, it’s still a school that has well more than 100 years of service to its community. So why does a stretch of eight seasons from 1986 to 1993 in all of those years stand out as being so exceptional in the school’s football history? Those happen to be the eight seasons when Merced was under the guidance of head coach Mark Speckman and even though it wasn’t that long of a time period before Speckman left to become a head coach at a small college in Oregon those seasons still represent a bulk of the greatest success the Bears have ever had. In Speckman’s second season in 1988, Merced rolled off 13 wins before falling short in the CIF Sac-Joaquin Section Division I title game 33-25 to Davis. That just set the tone for 1989. Head coach Mark Speckman built a powerhouse in late 1980s, early 1990s at Merced. Photo: mercedsun-star.com. With the Bears and their Fly offense hitting on all cylinders behind running backs Jhay Roland and Stephen Jackson, they went 13-0 again in getting to the section final but this time they won 31-29 in a memorable game against Nevada Union of Grass Valley. Merced wasn’t done in 1990, either. In fact, the Bears were even better. They went 14-0 for the second straight season, and beat Nevada Union again in the section final, this time 21-12. With also having a 50-21 win over Central Coast Section champ St. Francis of Mountain View, Merced’s resume was so impressive that it was ranked No. 1 in the final state rankings and the team was named Cal-Hi Sports State Team of the Year. The Bears then took a 28-game win streak into their opening game of 1991 where they took on Bay Area juggernaut De La Salle of Concord. In a game that Cal-Hi Sports attended, future NFL receiver Amani Toomer helped the Spartans beat Merced 35-21 to end the winning streak. In the following season at De La Salle, after the Spartans had lost in the CIF North Coast Section final to Pittsburg, Merced fell in the first game once again. The 34-14 defeat then became the first win for De La Salle on its way to its legendary 151-game national record. It took a few years after Speckman left for the Bears to regain their footing, but under current coach Rob Scheidt they have done exactly that and then some. Since 2004, there has only been two losing seasons and both of those were 4-6. Scheidt has directed the Bears to 8-3, 9-3 and 8-4 seasons the past three years and his teams in 2006, 2007 and 2008 went a combined 44-5. Merced’s first and only other undefeated team prior to 1989-1990 was a 1950 squad that went 11-0. Coached by Ernie Busch, the Bears completed their perfect season with a 20-13 win over Bakersfield, the winningest school (along with Long Beach Poly) in state history. That team also was inducted last March into the Merced High School Sports Hall of Fame, the second time that inductions into that Hall of Fame have been held. Since it’s difficult to say with certainty how many games the Bears played in their early years from 1898 to 1921, coming up with an exact all-time win total may not be possible. Still, based on scores that have been reported, Merced is starting 2016 with 506 or 508 all-time wins (depending on how one counts or doesn’t count forfeits). If it weren’t for some bad years in the 1960s, the Bears could be just about ready to hit 600. *Note: Two forfeit wins and one forfeit loss not included. Including those results, 1930s record would be 52-27-8 and 1950s record would be 48-35-9 and all-time would be 508-361-33. *Merced was 5-18-3 through 1972 against Modesto before winning 20 straight and not losing until 1997. **Does not include forfeit win in 1934. *Streak broken in first game of 1991 season by De La Salle of Concord, which the following season began its legendary national record 151-game winning streak with a victory over Merced. **Win streak ended with tie in first game of 1951, followed by a win, tie and another win for unbeaten streak of 15-0-2. Note: Merced had 0-9-1 winless streak in 1960-61.